The Tribute Award recognizes one outstanding international leader related to the yearly theme of "Le Bal de la Riviera". The Tribute Award is an original and unique piece specially created by the international Portuguese artist Joana Vasconcelos and produced by Bordalo Pinheiro. The Environmental Award recognizes outstanding environmental leaders, whether individuals or organizations, that have exemplified inspiration, vision, innovation, leadership and action for the environment. 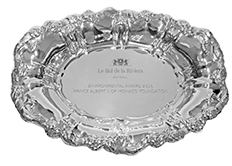 The Environmental Award is handmade produced by 19th century silversmith TOPÁZIO. The Solidarity Award recognizes outstanding leaders, whether individuals or organizations, with a proven record of achievement, as well as the potential to make outstanding contributions for promotion and protection of democracy and Human rights. The Solidarity Award is handmade produced by 19th century silversmith TOPÁZIO.